Here’s you’ll find any comments or statements made by Chris Kane in relation to his role as a member of the Labour Party and Stirling Councillor. You’ll also find more from Chris at the Stirling Constituency Labour Party website or by following him on Facebook and Twitter. * a descriptive term for those born within the ancient burgh boundaries of Stirling (click here and scroll down for the latest blog). Get regular news and comment about Stirling, Scotland with the “Son of the Rock” blog at www.chriskane.net. Written by broadcaster and local Councillor Chris Kane. Before moving online, “Son of the Rock” was published in the Stirling Observer newspaper. Welcome back! For a number of years I wrote a weekly column called “Son of the Rock” in the Stirling Observer. The Stirling Observer has been apolitical for 150 years and I didn’t want to jeopardise that, so when I stood as a candidate for both Stirling Council and at the 2017 UK General Election, I decided to take a break from “Son of the Rock”. But I miss the discipline of writing a weekly column and I still have lots I want to say and comment on, so “Son of the Rock” is back as a blog. Starting 2018 at the Braehead Community Garden Hogmanay Bonfire in Stirling. I will take the opportunity to be more political from time to time, but mainly I will talk about what’s going on in Stirling and what I think of things. I’ll also talk about things that amuse or impress me, things that make me proud of my community and things that are important to me – and I hope important to you. Local history is a passion of mine, so expect that to pop up regularly. Let’s get the Son of the Rock back on the road and have some fun together. If you’d like a weekly version of this column sent via email, sign up using the form below. If you’ve got an event or a topic you’d like me to cover, you can get in touch with me through the website. Featured Post by Posted in "Son of the Rock"
Just after 5am on 11th November 1918, in a clearing in a forest in Compiegne in Northern France, an armistice was signed between the Allies and Germany agreeing that the guns of would fall silence a few hours later, at 11am, bringing to an end the fighting of the First World War. At 11am on the anniversary of the armistice, we stop in supermarkets, in the street, at home or wherever we are, to observe a two minute silence as a mark of respect to those who have fought and died in war. In Stirling, the 96th Service of Remembrance took place at the War Memorial at Corn Exchange. Margaret Fleming is a name you’ll not find on Stirling’s war memorial, but her story is one I think about on Remembrance Day. The Clearing in the Forest in Compiegne where the Armistice was signed. Margaret worked in a grocer’s shop in Stirling while her husband John was a sailor, travelling the world as a stoker on a steam ship. Together they lived in Stirling, raising their family, including sons Thomas and Martin. In 1914 when war was declared, the Fleming men, like their neighbours and friends all over the country went to fight for King and Country. John joined the Merchant Navy, Martin the Argyll and Sutherland Highlanders and Thomas the Black Watch regiment. On the 27th October 1914, Thomas was killed in action in the First Battle of Ypres. He was thirty years old. Ypres, in Western Belgium, lay between the Germans and the English Channel – the Germans wanted to take the ports and cut off Allied supply lines. The Allies wanted to stop them in their tracks. Thomas was one of 8050 men on both sides who died in the battle. 29170 were wounded and 10545 people are recorded as missing. Margaret would have received a telegram at her home in Bank Street with the news that her son had been buried near to where he fell. 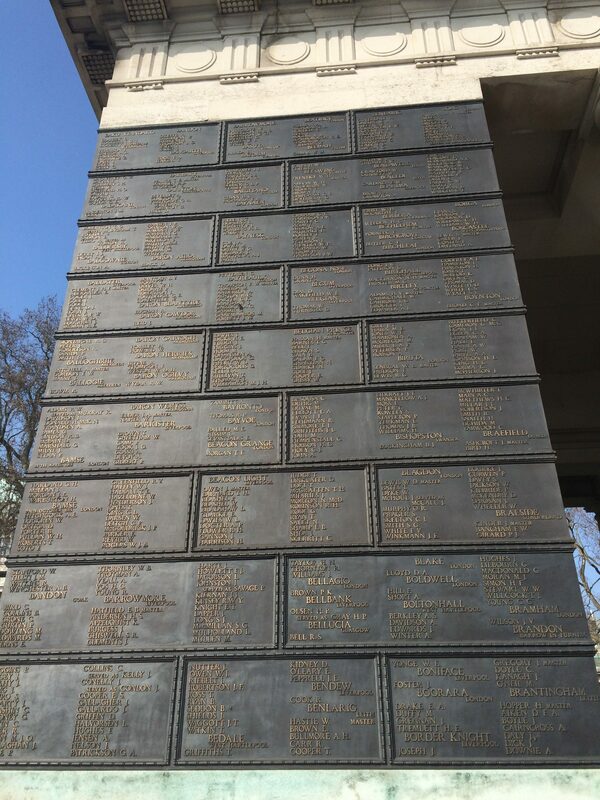 the Merchant Navy memorial in central London – John Fleming’s name is near the top. In 1917, Margaret would receive another telegram. Her husband John was serving on the steam ship Batoum, sailing between New Orleans and Queenstown in Ireland, bringing vital suppliers to aid the Allies war effort. John was a Donkeyman, responsible for the Donkey Engine, which helped pump water from the engine room. It was a hot, strenuous, dangerous job on the ship. On the 19th June 1917, the Batoum was less than fifteen kilometres from the end of its seven thousand kilometre trip. Some of the sailors would have seen the welcome light from the Lighthouse on Fasnet Rock. They would not have seen the torpedo from the German submarine before it struck. 41 of the 42 crew were rescued from the wreckage by the American Destroyer USS Jarvis. John Fleming was the only person who died in the attack. Margaret’s third telegram came just three months before Armistice Day in 1918. In the last six months of the war, from March to November 1918, both sides lost over one million men as the Germans tried a series of last ditch offensives and the Allies mounted counter attacks. Three hundred thousand British soldiers lost their lives in the last 100 days of the war. On 10th August, in Flanders, Martin Fleming was one of them. He was twenty years old. Stirling’s Book of Remembrance, listing all the names of those Stirling residents who died in war, is on display at Central Library in Corn Exchange. In October 1922, Stirling’s war memorial at the Corn Exchange was unveiled with a ceremony that included Earl Haig, Field Marshall of the British Expeditionary Force from 1915 until the end of the war. Immediately in front of the monument, positions had been reserved for the widows and mothers of fallen men. Behind them were the ex-service men and serving members of both the Regular and Territorial Army. Grouped along the railings of the Allan Park church were 200 Girl Guides, 160 of the Boys Brigade, 60 Boy Scouts and 54 Stirling Cadets. The public were on the slopes of the Back Walk outside the Albert Halls and on Dumbarton Road, thirty or forty deep. Every window overlooking the memorial was filled with faces. Some children had sneaked through a window on the municipal buildings and were sitting on the ledge with their feet dangling until they were spotted and ordered inside. There were people in the trees and there were people on top of the steeple on the Allan Park South church looking down. There were an estimated eight thousand people there that day. I cannot begin to imagine how Margaret Fleming felt that day in 1922 when she took part in the ceremony but I think of her and her family’s sacrifice today at 11am on Remembrance Day. One of the more unusual roles I have as a Stirling Councillor is as “Bailie Chris Kane”. The title is a ceremonial one today, but for hundreds of years while Stirling was a royal burgh, a Bailie was the precursor to a modern councillor. The official position of Bailie was abolished in law in 1975, but in 2008 Stirling Council revived the position with four Bailies to assist the Provost undertake the civic duties of the council. In Stirling the modern custom is that each political party can nominate one Bailie to ensure it is a civic rather than a political role – so we’ve got one from Labour, SNP, Conservative and Green. Another ancient role that Stirling has revived in recent years is that of Makar. Stirling’s current Makar, or official poet, is Clive Wright. Makars date back to the court of James IV in the fifteenth century and Clive is the third modern Makar since 2009 (after Magi Gibson and Anita Govern). It’s a three year term and comes with a honorarium of £1000 per year. At this week’s meeting of the Provost’s Panel, Clive was there to provide an update on his work over the last year. I snapped this picture of Clive performing his latest poem for Stirling all about the life of King James IV, with Provost Christine Simpson looking on. I wonder how many previous Provosts over the centuries have sat and listened to previous Makars in a similar situation – I was certainly aware of the long continuity of local history and felt very fortunate to be there to see it. The Makar works with schools and local writers to promote poetry, along with composing an annual “poem for Stirling”. I’m writing this at the kitchen table on Thursday afternoon, looking out of the window as the snow continues to fall as it has done for most of the day. My patio table has for fifteen years been the yardstick (perhaps literally) by which I measure snow depths. It’s currently at 14 inches and growing. The most my trusty table has ever had is nine inches, back in 2010. So today has officially seen the most snow to fall in my back garden since kane family records, and the kane family house, began, in 2002. I’ve given up clearing driveway after having been out with a shovel three times already today. I cannot remember colder days, but I cannot remember a day with as much snow lying on the ground. All of Stirling’s schools are shut for a second day and they’ll be closed again tomorrow. Stirling Council has gone into emergency mode, with all available staff on gritting / ploughing / assisting the vulnerable. The council staff are doing a remarkable job under difficult circumstances and I hope they all realise how much of a debt of thanks we owe them and how much they have my respect and admiration. One of the things about spending so much time at home with family is that nerves can get a little frazzled – which can lead to little outbursts of passive aggressiveness on the fridge! Normally on an unexpected day off I’d head over to the Community Garden to do some weeding. I’m not sure I could find the weeds today, but I did head over with my camera to see what was happening. The hens were all under cover and the braehead bees are well insulated anyway, but the extra coating of snow will probably help even more. Today’s “Dr Bike” session has been cancelled, but it will be back in a fortnight. We’ve teamed up with our friends at Recykabike and the Stirling Cycle Hub to offer free “health checks” for your bike. Simply turn up on 15th March between 4pm-6pm with your bike, and one of the technicians will give it a quick tune up. If, if, if the weather is good on Sunday, there’s an Active Travel Day in the garden between noon and 4pm and and I’ll be leading a bike tour around the Braehead Heritage Trail. I was persuaded to do it with the promise of a loan of an electric bike for the afternoon – it should be fun! Posted on March 1, 2018 March 1, 2018 by Posted in "Son of the Rock"